Nugenix Review | Does the Testosterone Booster Really Work? 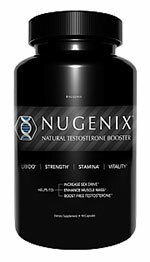 Nugenix is a supplement intended to increase testosterone in men. While we usually work through the facts before delivering an unbiased opinion, we strongly advise steering clear of this product. Not only are we skeptical of the claims that this product makes, but there are a lot of indicators that the primary ingredient that the manufacturers of Nugenix claims will boost testosterone actually boosts estrogen levels in men and women. Tribulus Terrestris, which is a common ingredient in many sexual performance enhancing supplements. It has been used for centuries in Chinese medicine to enhance libido and amplify desire. Tribulus terrestris can be found in many quality male enhancement supplements. Zinc is a little less common, but be careful when consuming products with zinc. If you consume a balanced diet and/or you take a multi-vitamin, adding a supplement that includes zinc could lead to toxic levels of zinc in your body which can have adverse health effects. The primary ingredient that we take issue with is fenugreek. Fenugreek is a common supplement that has been around for centuries. Unfortunately, its primary use has actually been to help women with newborn babies lactate. Studies suggest that it does boost hormone levels. The problem is that those hormones are for the ladies. This is why many users who consume fenugreek have reported breast enlargement (including both women and men). The drive to include fenugreek in a male enhancement supplement comes from one study conducted by a Texas A&M professor. It is poor science that makes health claims on a supplement based on one study. There is no other study that has been able to support the claims that fenugreek can boost a man's testosterone levels and serve as a male enhancement supplement. Our conclusion is that Nugenix does work, if you want to lactate or increase your bust size. However, if you are looking to increase your levels of testosterone, this is not the male enhancement supplement that you are looking for. We also conclude that the zinc in Nugenix, when combined with other zinc sources that most men are getting, could result in an unsafe level of zinc within the body that could then lead to adverse health effects. For men looking to boost their testosterone levels and/or use a supplement that will help them perform better in the bedroom, there are plenty of other supplements available. As mentioned earlier, most male enhancement supplements include tribulus terrestris. One product that comes chock full of ingredients in addition to tribulus terrestris that will boost performance in the bedroom is Endowmax. Click here to read our review on Endowmax. If you are looking to boost testosterone (and NOT estrogen) for increased sexual performance or as a body building supplement, there are many products that have been proven to work and won't make your breasts sensitive. One product that we have found that is highly effective is Growth Factor. Click here to read our review.